Cool: She is very nice to you. I have this same setup and it is one very nice tool as you describe. Congratulations. What a coincidence. 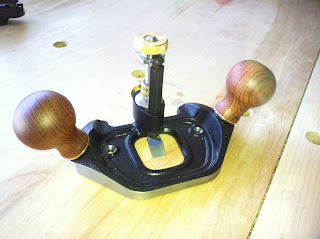 I too had a chance to use a router plane in a workshop several years ago and have since been thinking of all the things that I could use one for. Just last night I got serious enough to read a few older reviews on LJs and add it to my wish list at Lee Valley. Thank you very much for the detailed review. To aid in making crisp clean cuts I was taught to score the first cut with a marking knife or utility knife. The router than ‘follows’ these scored lines and leaves a very crisp edge. Congrats! its always nice when our better half’s surprise us with tools! Thanks for all of the great comments and I have several Lie Nieslen planes and love them but I enjoy my Veritas tools just as much. Deke yes mine did come with the sharpening adapter, haven’t tried it yet though. Mark, good point on scoring lines before cutting, I have used that techneique for years when planing and ripping. I definitely have a great wife. She knows that I love woodworking and working in the shop or writing about woodworking on my blog is a way that I relax. Again thanks for all the comments. I have this plane, but have had trouble with it. I bought it specifically to clean up dados on a particular project. That was white oak and I found that the blades simply did not hold up. Especially the pointed blade. It just curled up like an elf’s shoe. Maybe the white oak was just too hard for it. I don’t think I’ve tried any other woods, yet. Barry, I miss spoke….to many years of using a term I know is incorrect. The correct term for what I was refering to on my chisels is micro bevel. I typically use a 1 degree micro bevel, which allows me to spend less time keeping the chisel sharp for just touch ups as I can remove less material. Having said this I do use a slight back bevel on both my chisels and plane irons, by using the 6” mechinist ruler trick, but it is so slight of a back bevel that I just count it more as cleaning up the back edge. Since I had bothered to offer up my disappointing experience with this plane, I thought it fair to post again. Coincidently, I had a need to reach for it again shortly after my first post. I had to cut a notch in some red oak for a precise joint. After roughing it out and cleaning up the shoulders with chisels, I cleaned up the bottom with the router plane and took it down to the exact depth I needed. This was much smaller than the grooves and dados I attempted before and the plane did a fine job. It was definitely the right tool for the job. I’m guessing that the white oak was just too hard for the edge to hold up and it will be a more effective tool for woods that are less dense. I bought one a while ago. I love it! Liked it so much that I had to make a little box for it to sleep in a night. My next plane is going to be the plow plane.